Our Arabic CMMS software solution is widely used in the Middle East. The country of Iraq uses our CMMS to manage 40 gas-powered electric turbine stations throughout the country. MaintSmart was chosen because it is completely translatable into any language and for its powerful analytical capabilities. We provide free machine-translations of any language, however these usually require customization. The software offers a translation utility so that the user may customize the translation to the exact specification needed. Add additional translations if needed. There is no limit here either. Translations are either linked to a location, a user or could be user select. Contact us or our software distributor in the Middle east and North Africa. The CMMS solution also offers extensive analysis and reporting options. Equipment downtime and availability are of critical importance for a power generation facility. As such, maintenance management solutions that report and analyze reliability, availability, downtime and overall equipment effectiveness are essential in these facilities. When the login screen appears choose the language: "Arabic <country>"
Click one of the navigation icons at the top of the screen to start using the system. If you would like to customize the Arabic translation then proceed to the Program Configuration screen to access the translator module. Additionally from the translation module create a completely new translation. It is also fine to have multiple Arabic translations in the same database. Video on How to Create a Custom Translation. The translation tool offers a simple way to translate many similar text items at once. This tool is described in the video below. This feature greatly speed up the translation process and adds consistency to the translation. 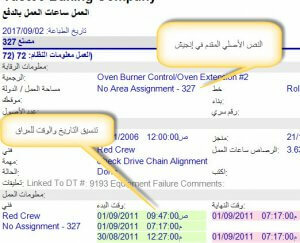 Create and Link to CMMS Database (Arabic Translated). Arabic translated video describes how to connect to a sample database and how to create your own empty database. Contact us for more information. Create a Work Order (Arabic Translated). 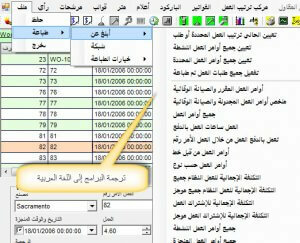 Creating work orders is a basic function of Arabic CMMS software. Learn how to do this by watching this video. For a personal demonstration in Arabic contact us. We have representatives in Iraq and Egypt that are waiting to help you. 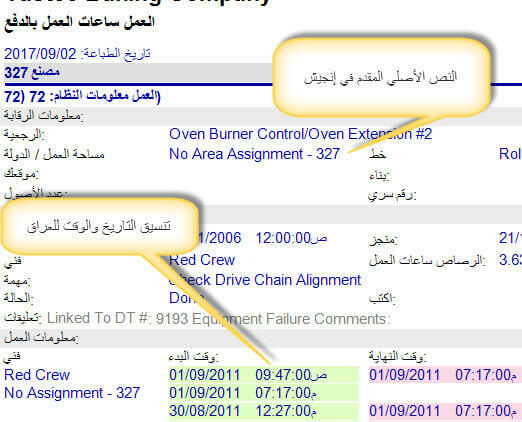 Create a Simple Work Order (Arabic Translated). In many cases a very simple work order or repair ticket is all that is needed. Additionally, there are several shortcuts available in this Arabic CMMS software such as work order duplication. Learn how to do this by watching this video. Edit and Close a Work Order (Arabic Translated). Editing and closing work orders is another basic, but essential skill when using CMMS software. Closing work orders is simple. Besides simply closing work orders learn close multiple work orders at the same time. Learn how to do edit and close a work order by watching this video. Create Work Orders Automatically (1/2) . Learn how to create work orders automatically with schedules, meters or by simple duplication by watching this Arabic CMMS software video series. Automatic work orders save time and add consistency to work issuance. For example, schedule a work order with spare parts list every Monday at 8:00 AM. The software generates this new work order as specified and then resets itself for the following scheduled day and time. Similarly, generating automatic work orders from a meter value is another time-saving feature. Meters are values such a timers, counters or other event-driven values related to equipment. These meter values are generated automatically in the Arabic CMMS software or entered manually by the user. For example, create a new work order automatically to replace the saw blade every 5000 cuts of a saw. Moreover, this work order contains a parts list and is even emailed directly to the person assign to this job. best of all when the job is complete another email notification is sent to other interested users. Learn how to create work orders automatically with schedules, meters or by simple duplication by watching this video series. Work orders are the basis of any good Arabic CMMS software solution. Being able to create these work order automatically is a big time-saving feature that also adds consistency to your work order management system. Create work orders automatically by day/time, day of week/time, calendar day/time, interval in days/time and by meter value. Meters are a unit of anything define by you as an Arabic CMMS software user. These meter are also optionally read directly from your equipment via an OPC compliant data link.